What did we do before the days of hair oil? Over the last few years I've tried my fair share of different oils - from top of the range to drugstore bargains. I've got my firm favourites but am always up for trying out something new and today I'm going to be talking about the most recent one to have been popped onto my dressing table. Their cool and funky range contains everything from styling products to deep treatments and each product from them is infused with a range of fab, unique ingredients ready to help your hair become healthier than ever. The 60s style packaging gives it that extra bit of cool and helps it stand out from the ever-growing crowd - I love the fun and colourful vibe. 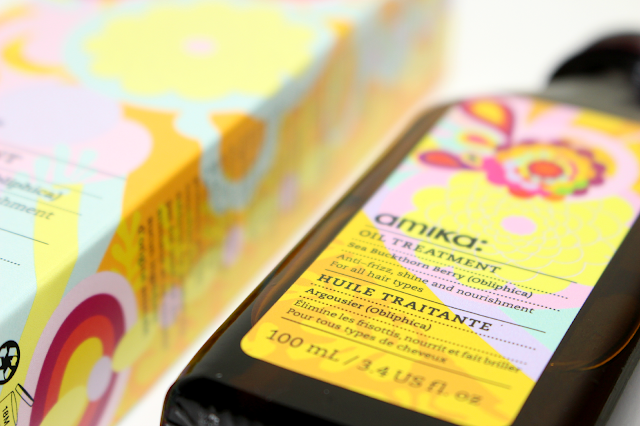 This oil treatment is something you can use on a daily basis. For me I love to pop a fair bit through the mid-lengths to ends of my hair when it is still damp and sometimes once I've finished styling, it's also great to inject a bit of moisture into those dry ends at this time of year. 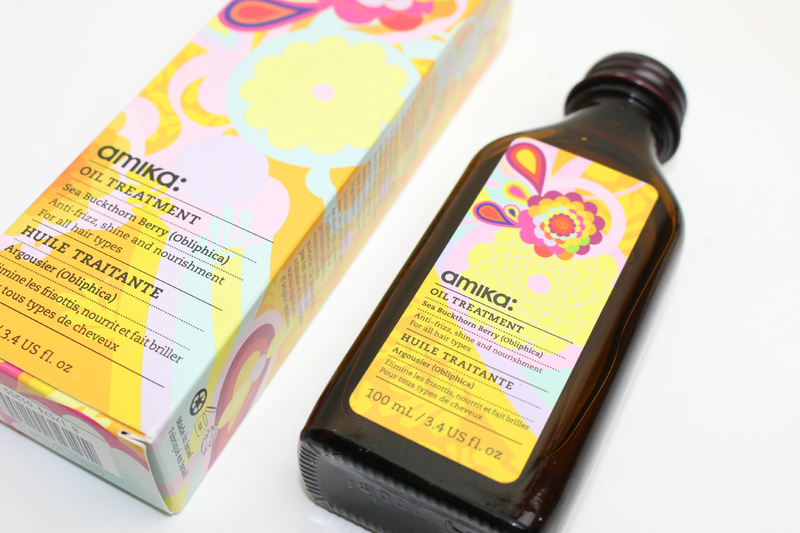 Full of Amika's secret ingredient Obliphica (Sea Buckthorn Berry) this stuff strengthens the hair whilst feeding it with much needed vitamins and nutrients. The scent is fairly strong but I'm a big fan of it, it reminds me of a certain perfume/aftershave but I just can't put my finger on it as to which one! The oil itself is fairly thick compared to others I've used so I have been using a little less than I usually would, which can only be a good thing right? I mean this 100ml bottle should last me months and months! The only probelm I have had so far with this stuff is the dispensing. The bottle comes with the plastic stopper on the top, with a tiny space for you to pierce a hole in. I did this but it was useless. Because the oil is fairly gloopy it just took forever to get a decent amount out (even after increasing the size of the hole! ), so I've decided to take the stopper out and just pour the oil out instead.... a little risky but SO much easier - really a pump would be the best option. The formula penetrates the surface of the hair to help seal split ends and improve shine and elasticity and I've been loving the last few weeks of using it. Anti-frizz is something I HAVE to have in a product at the moment, I don't know what it is but my hair has been so much drier and frizzier than usual and I've been trying everything to help it get back to how it used to be and I have to say this has been so helpful. For a 100ml bottle this stuff retails at £21.95 - a little more than your bog standard oil from Boots or Superdrug but like I said, you don't need alot so I can see this lasting for months on end! Overall I've been really enjoying trying this out and it's made me really intrigued to check out the rest of the products in the range - especially the shampoo and conditioner! This sounds really good! I'm not really in the habit of using hair oils (even though I have them), which is probably why they don't work as well as they should. I love the sound of this product, but it's such a shame that it doesn't dispense well. My hairs ruined- so can definitely see me trying this! After all the packaging is dreamy!! For years I used to be scared of hair oils, as I have quite an oily hair. Now I love using them though, they made such a difference. This sounds lovely and like you said, you don`t need to apply too much, so it will surely last a long time.